BirdLife International is a renowned global partnership of conservation organizations that strive to conserve birds, their habitats and global biodiversity. It works with over one hundred countries and territories worldwide and collaborates on regional work programmes in every continent towards environmental sustainability. As a BirdLife International Partner, MNS is recognised as a leading authority on the status of birds, their habitats as well as issues and problems affecting bird life in our region. In 2008, the Malaysian Nature Society received the inaugural 2008 Merdeka Award in the Environment category. This was mainly due to MNS’ work in the Belum-Temengor Forest Complex Conservation Initiative. 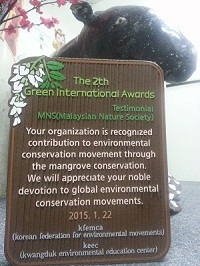 Upon receiving the award, MNS was lauded for its reputation of persistence, perseverance and consistency for the cause of conservation. The Merdeka Award was founded by PETRONAS, ExxonMobil and Shell to reward those who have made outstanding contributions in their respective fields to the people of Malaysia. It is aimed at encouraging Malaysians to strive above the ordinary and to promote leadership and excellence. MNS’ Kuala Selangor Nature Park (KSNP) was honored and acknowledged recently by the Selangor State Government, as one of the best ecotourism sites in the state. A Certificate of Appreciation was presented to our Park Manager, Maichal Isthyben by YB Elizabeth Wong, State EXCO for Environment and witnessed by the Menteri Besar of Selangor, YAB Tan Sri Dato’ Seri Abdul Khalid bin Ibrahim. Kudos to the KSNP Team! MNS bagged the EU-Malaysia Chamber of Commerce & Industry Europa 2012 Award at a gala dinner in Kuala Lumpur earlier this evening. Presenting the award was Mdm Mae Ho Seok Khen & Chief Operating Officer of BERJAYA UCH. MNS was represented by Immediate Past President Tan Sri Salleh Mohd Nor and Executive Director En Mohamed Shah Redza Hussein. MNS is heartened by this honor and dedicates this acknowledgment to all our supporters and members. Malaysian Nature Society (MNS) was honored by UKM with Community Engagement Excellence Award in recognition for its outstanding partnership with Universiti Kebangsaan Malaysia (UKM) in reaching out to communities. MNS and UKM had collaborated to integrate elements of research, education and service in a creative knowledge-driven project on wetlands and water conservation for youth. The SEE (Seek, Educate & Embrace) Nature Programme was launched at the Kuala Selangor Nature Park on World Wetlands Day that was celebrated on 2 Feb 2013, involving 200 school going children in mangroves replanting and clearing, bird watching, nature walks, lectures and video presentations. “The inaugural program began in 2012 with students from UKM staying in Kuala Selangor Nature Park to build their capacity on community-based experiences to inculcate awareness of nature and develop critical workplace competencies” said Prof. Dr. Maketab Mohamed, President of MNS, at the award ceremony in UKM’s Bangi Campus, on 26 June 2013. “MNS works across various partners and UKM’ collaboration for the young is pertinent. “I am pleased to announce that MNS and UKM will be collaborating in the region-wide Asean Youth Volunteer Program (AYVP) to take the SEE Nature Programme further”, he informed. MNS is also in discussion with UKM to launch the East Asian-Australasian Flyway Campaign (EAAFC) to protect wetlands in North Selangor and to provide livelihood options for the local communities in a 4 prong conservation strategy. 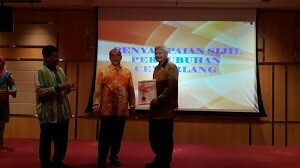 Malaysian Nature Society was honoured the “Pertubuhan Cemerlang” or Excellent Society award by the Registrar of Societies of Malaysia. The award ceremony was held on 3rd March 2014 and the award was presented by the Registar of Societies Chief Director, Y.Brs. Tuan Mohammad Razin bin Abdullah. MNS was awarded by KFEMCA (Korean Federation for Environmental Movements in Cheonan-Asan) and KEEC(Kwang Environmental Educatio Center). MNS was awarded for our mangrove conservation efforts.